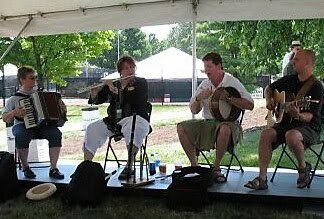 The Clifton Opera House presents the entertaining celtic band "Knot Fibb'n" on Saturday, March 26th at 7:30pm and we are NOT FIBBING, it is going to be a great show! From Columbus to Nashville, Chicago, Brooklyn & Savannah, through Pennsylvania, West Virginia, Iowa & Wisconsin ... presenting a unique, crisp style to the traditional Irish-American music scene, the four members of Knot Fibb’n have covered a lot of ground performing, recording and entertaining tens of thousands of fans in the years since they first joined forces around a dining room table in November of 1997. Their schedule is a busy one — Knot Fibb’n has played the Bethlehem Celtic Classic, Dublin Irish Festival & Blarney Bash, Chicago Gaelic Park Irish Festival, Hunter Mountain International Celtic Festival, Manheim Celtic Fling, Columbus Arts Festival, Brooklyn Great Irish Fair, Rochester Irish Festival, Ohio State Fair, Old Tyme Folk Music and Celtic Music Festivals in Waynesville, Dayton Celtic Festival, Dayton Feis 2000, Highland Folk Festival in Delaware, Middfest in Middletown, Multicultural Festival in Parkersburg WV, and various other festivals and concert series in Ohio, West Virginia, New York, Pennsylvania, Kentucky, Illinois, Iowa and Wisconsin. The Clifton Opera House is located at 5 So. Clay Street, Clifton. It is owned and operated by the Village of Clifton. All donations are used for the maintenance of the historic Opera House. Call 937.767.2343 for information.